According to a recent news article from WMUR, first responders were called to scene for what they are describing as the most difficult extraction for a car they were ever required to do. This goes for one 20-year fire department veteran who said this was the worst in which he had ever participated. In some cases, where the car is suspended in a precarious position, rushing in might seem like the way to go, but this can end up with the first responders becoming victims themselves. Authorities have said a car crashed through a guardrail on Intestate 93 South and flew off the roadway, where it got hung in a bunch of trees. There were three occupants in the car at the time. The car was hanging upside down, and the people were trapped there for hours as the firefighters worked toward the vehicle. The first thing they had to do was stabilize the hanging vehicle with lines, and then they were able to begin trying to get the occupants out of the car. Firefighters chose to use the Jaws of Life, which is an air powered or hydraulic tool designed to cut through just about anything. Even though they were working as fast as they cold with the best possible rescue equipment, it took another hour of cutting away part of the car before the victims could be extracted. Once they got the three occupants of the vehicle to safety, EMTs began to work on the victims. After they were provided immediate medical attention, medevac helicopters transported two of the victims to Boston shock trauma centers, and then the third was taken by ambulance to a hospital. There have not been any detailed reports on the condition the three victims who were brought to local hospitals, but it has been released that their injuries are very serious and possibly life threatening. Once firefighters extricated the occupants from the car, they began working on cutting the car down and hauling it away from scene of the serious car accident that resulted in significant personal injury. 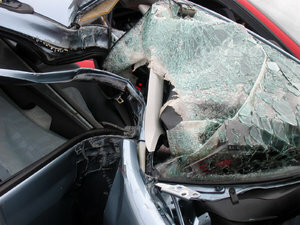 They noticed that the floorboards had been pushed up into the driver’s seat, and that likely led to many of the personal injuries suffered by the occupants of the car. The roof had also been pushed down toward the passenger compartment. Occupants of the car involved in the accident told someone they had other friends with them in the car, but police could not find anyone else. They even went so far as to search the woods using heat-imaging scanners, looking for any signs of human life, but their search did not yield any results. Authorities are still just beginning this this investigation and will follow up on exactly who was in the car at the time of the accident, though it is of course possible they were incorrect. Authorities also stated that at least one of the occupants in the vehicle was wearing his seatbelt, and it is believed that this greatly helped this victim to avoid more substantial personal injuries.